Order pro quality business cards right here. Get 250 full-color cards printed and shipped to you for as little as $49, or 500 cards for $59. These are professionally printed, standard size business cards, printed on 14 point coated “card stock” with various places for personalization including title and certifications, tagline, email address, phone number, personal website, your school’s reservation line, school’s website, etc. These are a “turnkey” solution for your professional image on and off the hill. You’ll look like a real pro and be proud to hand these cards to your clients. But wait, there’s more. Get an Individual Pro website for a year for $49 and get another $20 OFF your business card order! Before you order your cards I wanted to let you know you can get an Individual SnowPro website for a whole year at a ridiculously low price of $49. Yes, for 12 months! That’s more than 50% off the normal price. And if you signup for the annual plan – again just $49 – you will receive a welcome email with a coupon code for $20 off your Pro Business Card order. Yep, that’s 250 business cards for just 29 bucks! In all, that’s a total savings of over $70! This is quite a deal and only available to the “early adopters” like you. You can check out the links below to my personal Individual Pro website and get some more details or just sign up. When signing up for your individual Pro site use coupon code “PSIANW50” – yes, in ALL CAPS – but only the first 20 PSIA-AASI Northwest Members are going to get this awesome deal! It won’t last long. If you just want to take advantage of the awesome Pro Business Cards Deal, then proceed to ordering cards! You might recognize my other work! 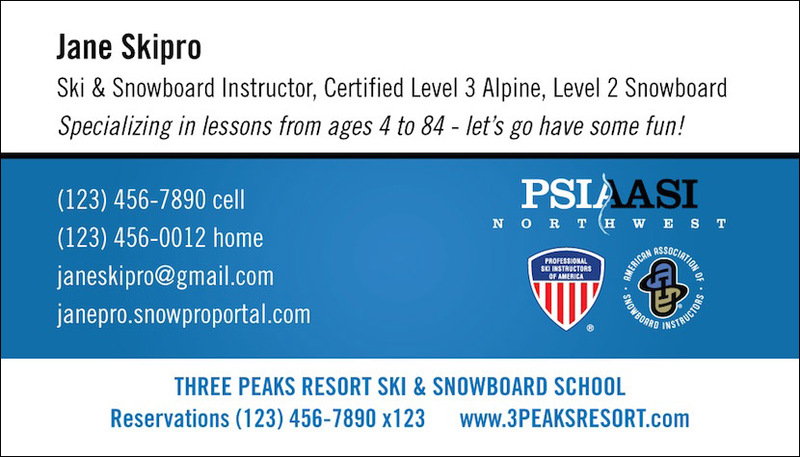 I am the PSIA-NW Newsletter designer and webmaster. I am the designer and implementer of the Rocky Mountain, Northwest, Intermountain and Central division websites. I have also helped the Eastern Division with the visuals for the More Fun Starts Here campaign, the “Learn. Turn. Smile. Repeat!” campaign. I am a PSIA-NW Examiner, Technical Team Member, the current PSIA-NW Communications V.P., however this service is completely independent of yours, or my, relationship with the Divisions or the National Organization. Find out more about me and SNOWPRO PORTAL™ on the about page. We donate $2 per order to your Division’s 501(c)(3) Education Foundation. Don’t see your organization listed above? Contact your organization leaders and request to participate in this FREE program.